This development will form a dynamic and visitor-friendly link between the Bristol Temple Meads Railway Station and the city centre. The master plan encompasses a newly created site which unlocks a previously isolated piece of land. It prioritises pedestrians and cyclists with a new walkway, the Brunel Mile, and a new public square set to reinvigorate the area. Grimshaw’s scheme for Engine Shed 02 breathes new life into the long derelict, Grade II listed George and Railway Hotel, elegantly connecting a new six storey office and co-working space. 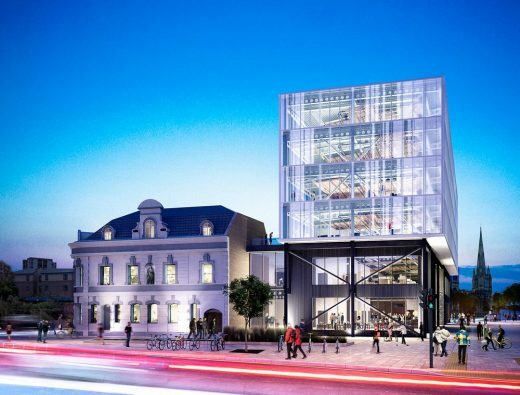 Proposing over 43,000 sq ft of floor space, the building is adaptable and column-free, with configurable spaces suited to the current and future needs of Bristol’s start-up and business community. Lower levels are designed to emulate a ‘shed’ through the use of profiled metal cladding and external structural steel elements. Responding to its context, the home for Engine Shed 02 celebrates the engineering legacy of Victorian architecture with its lower floors referencing features of the adjacent hotel, and its relatable scale ensures the scheme sits in harmony with its neighbour. The character of the upper levels of the building is distinct from its industrial base, with the use of diffuse screening elements and patterned glass creating a considered mass that adds discernable presence to the scheme. The glazed office element provides the shell for a commercial office space yet retains the spatial qualities of an art gallery or studio, ultimately creating an environment that can flex to needs of the businesses it will house. 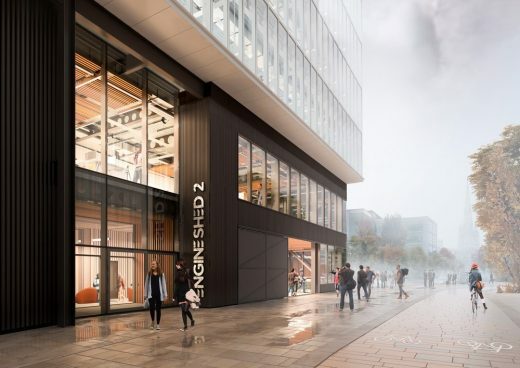 A public consultation was held earlier this month, and the planning application for Engine Shed 02 was submitted to Bristol City Council yesterday.